On Wednesday, February 6, 2019, the country celebrated National Girls and Women In Sports Day. This year is the 33rd anniversary of the event, and it is a day that we will be celebrating for more than just a day at Detroit PAL! National Girls and Women in Sports Day (NGWSD) began in 1987 in America’s Capital to recognize the promise in women’s sports and recognize elite female athletes. For over thirty years, this celebration has encouraged and empowered girls to get out, get moving, and get involved in athletics! The benefits of girls and women getting active include a surge in confidence, strength, and character which allows growth academically, professionally, and personally. One of the elite female athletes that is recognized annually on NGWSD is Flo Hyman, an Olympic Volleyball Player. Hyman saw great success in her life as an empowered individual in women’s sports who was quick to give the credit to her team rather than take on individual glory. Her grace and integrity earned her immense respect from the athletic world. Hyman was taken at a young age after collapsing during a volleyball match. This month, we remember Hyman by following her lead to take the courts and fields with passion, and celebrate successes with humility. Throughout the month of February, Detroit PAL’s female athletes will be filling out cards about why she likes to play sports, why she is a female athlete, and how sports help her develop leadership skills! Our female athletes will then take pictures with their cards and these pictures will be displayed at different Detroit PAL 50th anniversary celebrations throughout the year! The goals of GCG are to increase the number of girls ages 4-19 playing sports and increase the number of quality programs for the girls we currently serve. We hope to see girls make up 37% of our participants in 2019. By 2020, PAL hopes to see females make up 40% of our participants. We also hope to see increased numbers of our trained female coaches and mentors. To continue growing GCG, Dr. Cox and her team will be working hard in 2019! The team is actively seeking funds to continue to serve more girls and increase our number of programs we offer. In the next one to two years, Dr. Cox hopes to see: a flag football clinic for girls, a sports sampling summer camp, non-traditional sports opportunities for girls, more girls empowerment workshops, introduce yearly mother – daughter activities, and host a female coaches conference! We encourage you to join in GCG’s mission to make a difference in the lives of Detroit PAL’s female athletes. 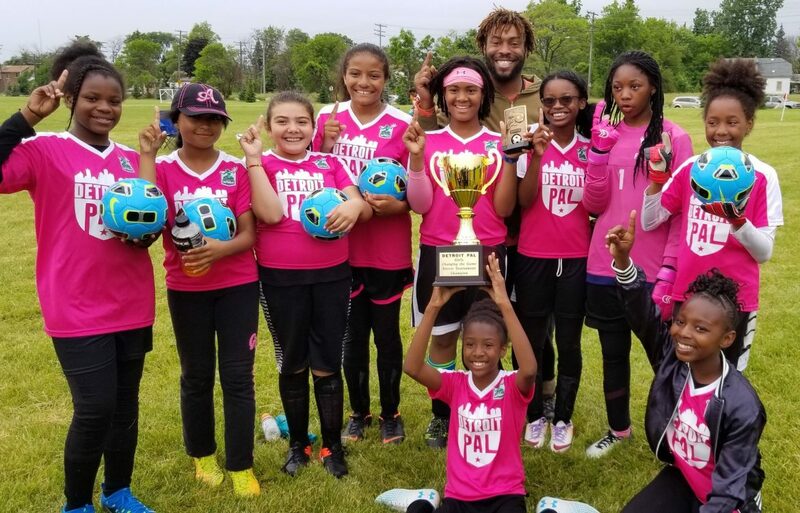 If you wish to support us please visit: https://detroitpal.org/donate and specify that your donation is for the Girls Changing the Game program in the Additional Comments section on the form!